MEGA64 MEGA UPDATE!! "JOURNEY" SKIT, AND NEW MERCH, AND NEW PODCAST!! We'll cut to the chase- Mega64 has finally released their "JOURNEY" skit, and it ends in a way that is still stunning to us now. We hope you are as shocked as we were when it happened. Please watch our new Journey skit below or over at YouTube. Naturally, nothing makes more sense at this point than to add a new shirt to our online store... that is referencing a completely different skit. From one of our favorite moments in our "Skyward Sword" video, it appears.Â With a grin and demonic giggle, our new "GAME OVER" shirt is now on sale. Order one now and get a secret mystery prize included. 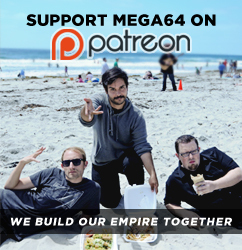 And last but not least, we have a brand new Mega64 Podcast for you to consume. If you want to hear behind the scenes stuff on "Journey" or hear us review some new games, the Xbox One, the Daft Punk and Queens of the Stone Age albums... and baby back ribs... you may just want to check this one out. Watch below or get it from iTunes. Audio version right here.